I just discovered a British food import store near me that I guess has been there forever. I popped in to look around and saw an old treat that my friend in highschool would bring back from her annual travels to visit family in Ireland, flake. I don’t know if Ripple came around after flake or not….oh wait – the internet – now I know Ripple came out 30 years after flake started being sold in 1930. 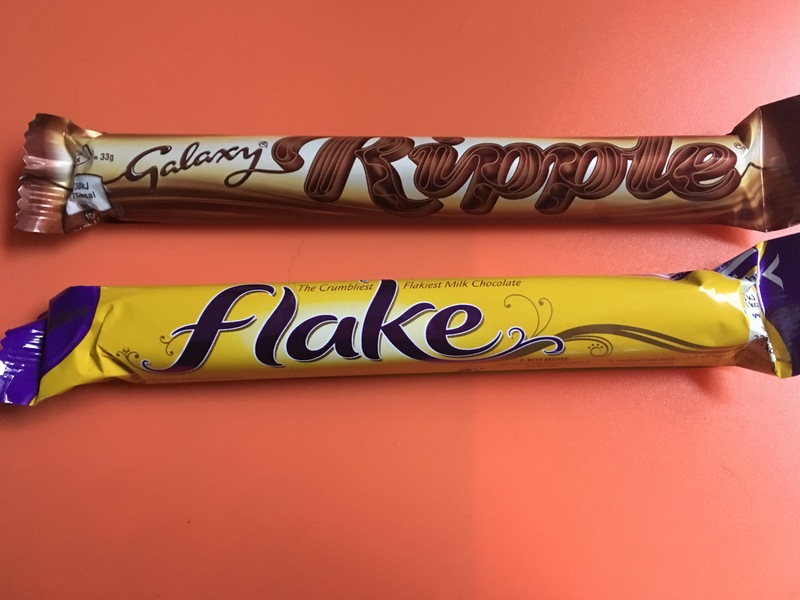 Did Ripple somehow perfect the flake model of crumbly chocolate? 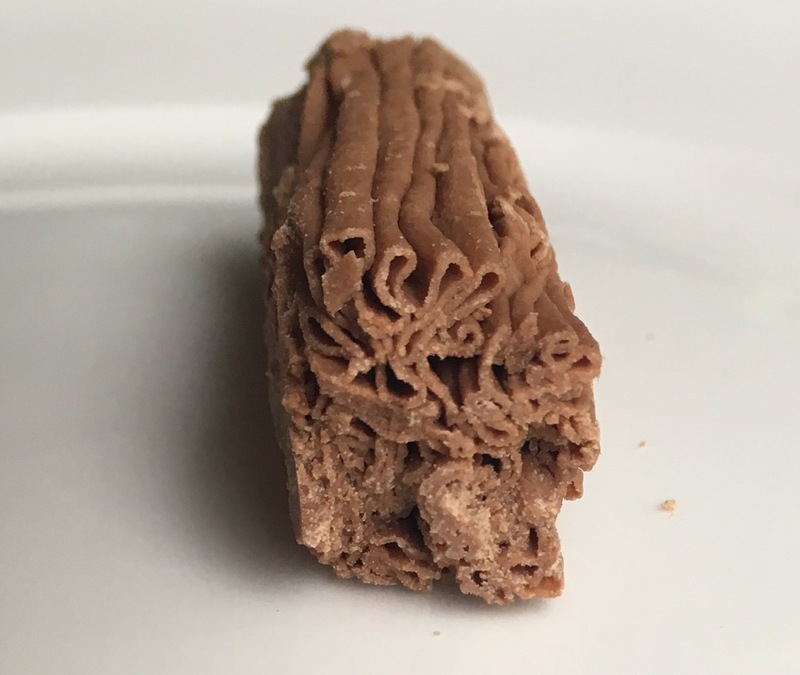 We found flake to have a very pleasant texture, the density of something light like the Aero bar but with different distribution of space. The chocolate itself is very creamy and not too sweet. Because of it’s creaminess, pockets of air in the chocolate help distribute the richness of the chocolate. Personally, I always find Cadbury milk chocolate to be too heavy for me, so this is the perfect presentation for Cadbury. One thing about flake that isn’t perfect is that no matter how careful I try to eat this, I look like cookie monster. There’s just no way around it’s flaking off into particles all over the place. I wonder if “crumble” might have been a more appropriate name. Visually, Ripple’s interior is similar to flake with it’s folded ribbons of chocolate. We were interested to see how the chocolate coating would hold up and if it would help with the crumblefest that is unavoidable with flake. The outershell does help, but to our dismay the chocolate wasn’t very enjoyable. Tastewise it lacked chocolate flavor and tasted artificial – and it stuck to my teeth so that took away from any enjoyment. If we had to choose looking like a civilized human being or eating something worth the calories, we’d stick with flake. It might be messy but at least it tastes good and you don’t have to deal with chocolate adhering to your teeth and it actually tastes like chocolate. We both couldn’t even finish the Ripple, it just tasted so gross. 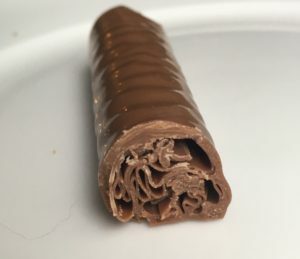 Check out Twirl by Cadbury (also an import) it’s a chocolate covered flake and delicious! Did anyone notice in the vote it says ribbon and not ripple??? ?